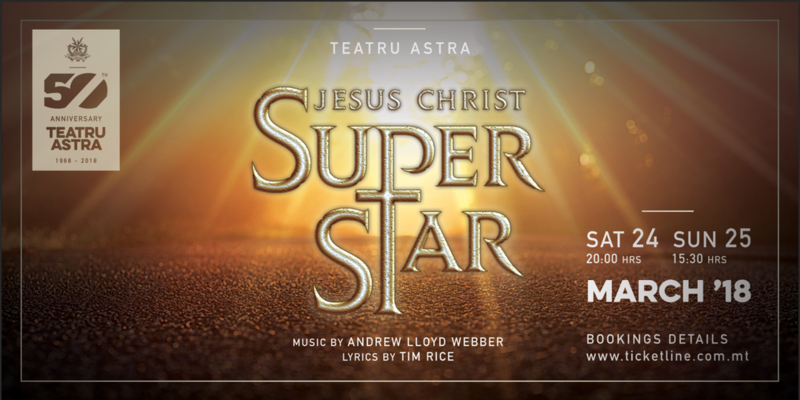 Teatru Astra is proud to announce the musical 'Jesus Christ Superstar' for March 2018 – a highlight in the 50th anniversary celebrations of Teatru Astra. The theatre opened up its doors to the public in January 1968. Jesus Christ Superstar is the third consecutive musical being staged by Teatru Astra, following the electrifying debut with Grease in 2016 and the sell-out tour-de force of Evita earlier in March this year. The musical, another masterpiece by Andrew Lloyd Webber and Tim Rice, gained its first success after the release of the concept album in 1970. This success led to the Broadway opening in 1971 under the direction of Tom O'Horgan, where the musical lasted two years having reached more than seven hundred performances. The story is loosely based on accounts of the last days of Jesus's life taken from the Gospel from his triumphant arrival in Jerusalem to his Crucifixion. The plot is formed around the political and personal struggles between Jesus and Judas Iscariot, which are not necessarily present in the bible. This way, the musical offers a free interpretation of the psychology of Jesus and other characters. The lyrics are packed with contemporary attitudes, as well as ironic allusions to modern life that are scattered throughout the depiction of these political events. A double representation of Jesus Christ Superstar is scheduled for the weekend preceding Easter, on Saturday 24 March at 20.00hrs, followed up by a matinee performance on Palm Sunday, 25 March 2018 at 15.30hrs. Online booking will be available in the coming days on www.ticketline.com.mt. Reservations can be made on + 356 79244048. Tickets will also be on sale from Teatru Astra.